Shot after shot you hit a stray and the disappointment you have with your golf swing mechanics can be detrimental to the health of your game. They say "golf is played on a 5 inch course" but if you can't hit the ball effectively then your mental game is worthless. You may feel that you have no hope and that is ok because you can regain it by following the elements great players demonstrate for your swing. 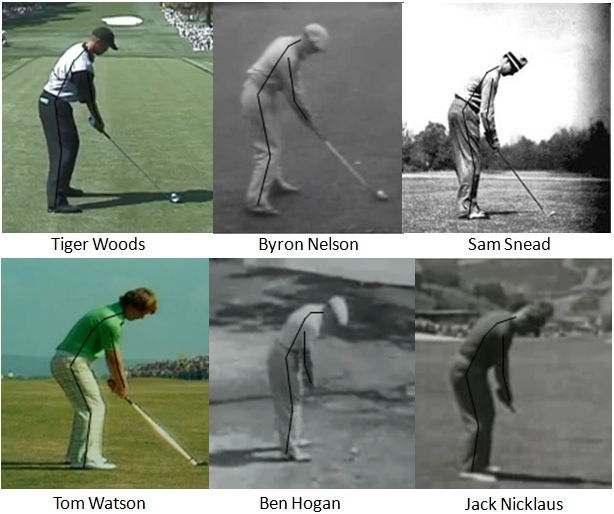 Great players of the past century all had different setups, grips, postures, and ball positions. Just Check out the setup spectrum of 6 of the greatest golfers to play the game below. If the great players had these differences then what elements did the great players share in common? The answer would be "they are consistent in hitting the ground at low point, having enough power to play the course, and being able to control the face to the path to control trajectory" (Andy Plummer/Mike Bennett). 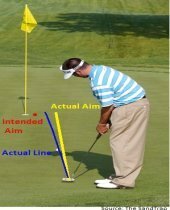 Low point is defined as being able to make contact with the ball and taking a consistent divot after the ball each time at the point where the club reaches its longest. The following two pictures will help illustrate what Low Point is. You may already be asking yourself "what about the players that play golf and don't take a divot? Are there any great golfers that didn't take a divot after the ball?" Yes, there have been quite a few and one who is most notable would be Tom Watson. You can still play great golf without taking a divot but you will still need the sound mechanics required for low point to also happen with picking the ball clean off the turf. The sound golf swing mechanics that allow for this to happen will be explained in the golf swing basics below, most notably "golf impact." Golf courses that have been built over the last decade have been stretched beyond means and the technological advances made in golf equipment has only helped that cause. Great players over the last century all have hit the ball considerable long distances during their era. With the ability to hit the ball further, great players are able to take advantage of scoring opportunities. However, this is not implying that you should strive to be the longest hitter, but only to hit the ball a sufficient ways to play the course within your means. This area of golf swing mechanics is very important when it comes to the consistency of your ball flight. For the longest time, golf instruction has taught that the path is the most important aspect in determining the starting direction of the golf ball. That is simply false. With the aid of technology, TrackMan has proven that instead it is the face angle that determines the ball's starting direction. 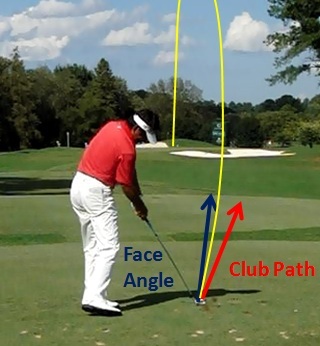 When you strike a golf ball, that ball's starting direction is going to be influenced by 85% from the face angle and the curvature of the golf ball will result in 15% from the path. If you would like to know where these numbers can be found, they are found on page 2 in (TrackMan Newsletter 5). How can this information help your game? It will empower you to be more decisive with your shots. For example, if you needed to hit a draw around a tree, you would simply return to impact with your face aimed right of the target with the path even further right of the face to ensure a draw. If you would like to learn more about this new concept visit my D-Plane page. 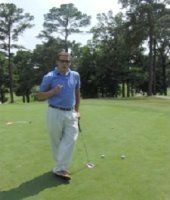 Considering the information that is now known about what makes you a great player you can now follow the key pieces of the swing that will help you build sound golf swing fundamentals. I hope you have found this section of golf swing mechanics to be very helpful for your game and if you can learn to implement the 8 fundamentals one step at a time then I am sure your game is going to improve!